So! Baby arrived last week. 🙂 The birth story will post next week. But for now, we’re talking placenta. That is, how to encapsulate your placenta. There’s quite a bit of controversy out there about the placenta. Does it have health benefits, or not? Is it dangerous to consume? And the truth is, we don’t really know. We don’t have adequate research into consuming the placenta to say for sure that it is or isn’t beneficial. This lack of evidence has led most of the mainstream to state that it isn’t worth the “risk” and that it’s potentially dangerous (even though there’s no evidence of danger, either). Of course, the placenta must be treated properly in order to be safe to consume. It isn’t hard at all, but it can feel intimidating when you haven’t done it before. I’ve done it twice now, so I’ll walk you through the how-to of encapsulation today. First, let’s look at the benefits (or potential benefits). The majority of these benefits are being reported by women who have tried it. Some women have only had babies and consumed their placentas; other women have had pregnancies where they didn’t consume the placenta and pregnancies where they did, and noticed significant differences in their postpartum experiences and recovery when they did do it vs. didn’t. Especially since we lack “real” evidence, I think we should pay close attention to these experiences. One study shows that the majority of women who consumed their placentas reported positive benefits and that they would do it again. The majority of studies, however, simply discuss attitudes towards consuming the placenta, asking why humans don’t (usually) do so when most mammals do, and note a need for actual studies. There really are no studies out there that truly look at the benefits — so we can’t really rely on this for information, unfortunately. Please note, a lack of information is not the same as “no benefits.” It just means, we don’t know for sure. Note: there are pictures of placenta below. I assume you would expect this from the title of the post, but just so you know. Now that we’ve discussed the why-or-why-not, if you’ve decided to go ahead, you will want to know how to do it. Know that there are many encapsulation specialists out there who can do this for you. Some will do it raw, and some will steam it with specific herbs first. They will then use the following process. For many women, immediately after birth is not a time they are willing to take on a DIY project. In that case, you may prefer to hire a specialist to do yours. This can cost $100 – $200 because it requires picking up the placenta on short notice, a fast turn-around time, and typically delivery of the finished capsules. If you have someone who is willing to help you with at least the first couple steps, then you can easily encapsulate your placenta yourself. I have not found it difficult to do at all. Ideally, your placenta should be processed within hours of birth. If you cannot do it within 2 – 3 hours, then you should put the placenta in the fridge. This will make it last up to 72 hours (but ideally the process should be complete prior to that). If you cannot do it within 72 hours, freeze it instead. The placenta should not sit out too long, or sit in the fridge too long, or it may become unsafe to consume — so always err on the side of caution in preserving it. If possible, have someone get it dehydrating immediately. Once it is dehydrated, it does not matter how long it takes to get to the next steps. It could be days or weeks or even months (although this won’t exactly provide you much benefit), but once completely dried it is safe and will wait. If you prefer, you can also make a placenta tincture. So! 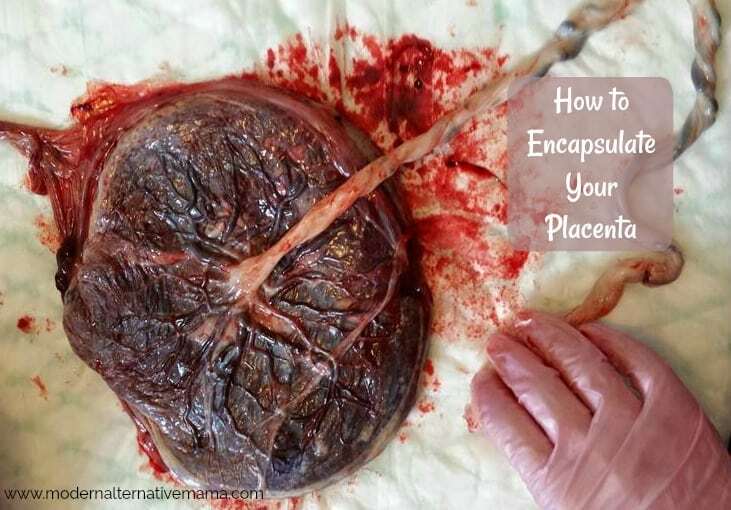 How to do encapsulate your placenta! Step 2: Cut off the cord and the sac. We don’t have a picture of this because, well, it’s a messy job and my husband was doing it alone. Step 3: Rinse the placenta well to remove as much blood as possible. Again with the messiness of it…. Step 4: Cut the placenta into thin slices. This one is more in small chunks, which is also fine. Step 5: Dehydrate this at 150 degrees (highest setting) for about 12 hours, or until completely dried. You don’t want any moisture in this at all. If you don’t have a dehydrator, you can use your oven on low (170). When the placenta snaps or crumbles, it’s done. If it is bendy at all, it’s not. Step 6: Once dry, run it through a spice grinder or blender to powder. Step 8: Open your capsules — I chose gelatin capsules — and place them into the machine. Note which part of the capsule goes in which side, because they are different! Step 9: Add some of the powdered placenta to the ‘large’ end of the capsules. Step 10: Scrape it across, and use the provided tool to tamp it down. Then add more if needed (typically you will need to). Step 11: Put the other side on top and press them firmly together. This closes the capsules. Then you have this! Pop the capsules out, and put them in a jar to store them. There are various theories on this. Most say you want to start taking them by 2 – 3 days postpartum. I really don’t recommend waiting until several months postpartum. I did that last time, and when I began taking them, they messed up my hormone balance even worse. The idea is that you take them soon after birth, and they prevent your hormone levels from dropping too rapidly. “Normal” hormone levels in pregnancy are about 3x what they are typically, and soon after birth they can drop to even lower than normal for non-pregnant women, which is a huge shift. Use the placenta capsules to help with this shift! Some recommend taking 1 – 2 everyday, more if you feel like you want to. Others recommend starting at about 6, and stepping it back by a pill or two every few days, until they’re gone. Many women feel that 6 is way too many. I’m personally taking 2 per day until or unless I feel like I no longer should. There’s really no “one” correct way to do this, so go with what works for you. Will you encapsulate your placenta? Have you had benefits from it before? Thank you for writing such detailed, clear instructions! If I ever have another baby, I will still most likely be paying someone else to do this for me, but it’s nice that the info is out here for anyone who is interested. I did encapsulate my placenta after the birth of my son. Since I only have the one birth experience (and therefore nothing to compare it to), I can’t definitively say it helped, but I can say that I never had problems with PPD or milk supply. I do know two people personally (who don’t know one another) who swear by placentophagy to help with depression; both were skeptical, but decided to try it once they recognized that they were dealing with something worse than “baby blues.” And for both, their symptoms immediately lessened. That was enough to convince me, and since I’m prone to depression anyway, I figured there could be no harm in getting my own placenta encapsulated. Where did you get your encapsulation machine from and how much was it? I got it from Mountain Rose Herbs. It was somewhere around $20. Hello! What size capsules should I buy? Most people choose to go with size 0 since it is smaller and thus easier to swallow. Can you tell me what size capsules are used? I am going to be doing this for my daughter and I want to make sure they are not too big or too small. You are so awesome! I am 44 years old and 30 weeks pregnant with surprise number 3. We are choosing a home birth and will be encapsulating the placenta thanks to your site. Your writings have inspired me and I have followed your journeys for a few years now through Facebook. I was so scared of this pregnancy and what would happen but you have truly made my fears seem so juvenile. I am actually looking forward to this new challenge and best of all, I know that my goal of being a doula was not so farfetched after all. So you don’t need to steam the placenta first? I read another diy where the woman steamed here’s then dehydrated?